Both the Mr and I were miffed at missing out again this year. So what if we both work from home? We’re in the lycra (well, one of us is) and off on the tandem to do a whizz around the block. 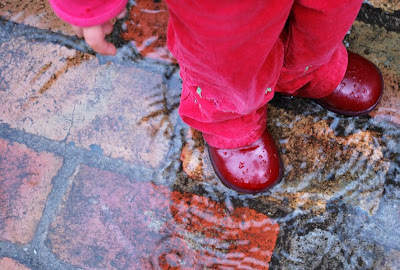 After looking mystified at all that palaver above, the two year old embraced parental distraction to go off and love some puddles. Strange how the wearing of gumboots induces surefire watery indifference. Well it’s hot around here – and at Christie’s. Can’t. Stop. 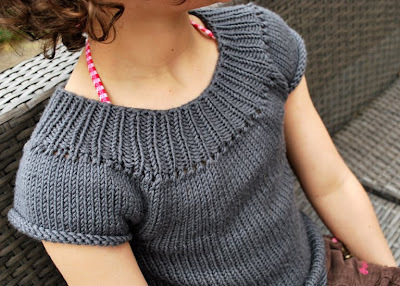 I suspect it’s all about the knit in the round, no seam thing. Plus it’s so simple I can do 13 stitches without looking while (almost) keeping up with United States of Tara. Which is another ‘hot’ except tonight it’s the last episode of Series One. Next Wednesday is looking distinctly cool to mild-ish. Even if it means another wee small hours crafty soiree, I’m ready to get to grips with the zip. There is a chance these suckers aren’t as scary as I think. There’s a smaller chance I’ll create something wearable (although I may, while wearing, have to keep all moving and blurry-like). I’m catching an unsavoury (old apple?) waft every now and then – and I’m on the hunt. My bets are on some sort of anklebiter snack stash catalogued somewhere amongst the CD collection, which, before you get frightened, is not even close to Dewey system-ed. 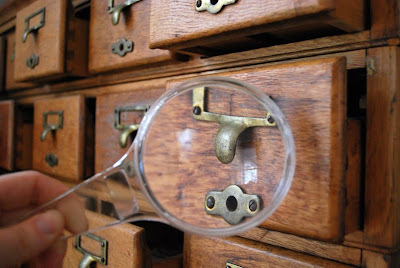 Even though I have lived with these drawers for ten years, even though I thought I had introduced myself to every hidden personality in this house, I just now realised there’s a veritable crowd of slot-eyed critters keeping mouldy snack secrets. Despite the holding my nose thing, this therefore, is no longer a NOT. In my book, this is a scorchingly HOT. I just bought that knitting pattern after seeing it on Pigeon Pair as well. Can't wait to get started on it! I too have fear of the zipper! let me know 1. how you go and 2. where you learnt. The one big question I have is which one of you was wearing the lycra and doesn't it cause chaffing?? You will master the zipper...do not be afraid...quite easy and then wonder who actually started all the fear about zips. Was it Mr Zip himself? Hope you have a bit of zippity fun. The invisible zipper is a cracker - not too hard at all (though I still have reservations about the lapped zip - its a dog). Now a question ... why are all the drawers saying "Oooooh" in unison? Is it the smell? 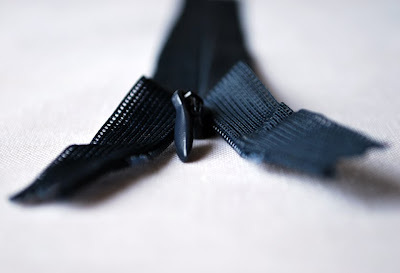 Last time I sewed an invisible zip, it came with a gadget which made it super easy so I think you've chosen well. Also having CD storage envy. 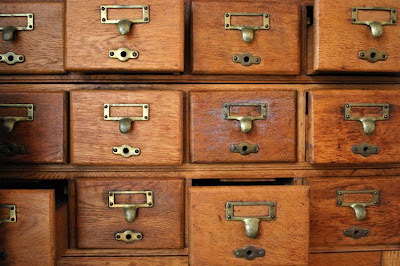 I would love library drawers for my sewing space. Have been a bit out of touch recently and just caught up on your apron making with Thea's lovely linen towel - waist looking very svelte and apron delightful. Is tandem biking the secret to shapely waist? Lisa. Those drawers!!! OH MY GOODNESS! I want some whiffy smell and all! There is a lot to mull over in this post. I don't know where to start...! I too want evidence of lycra wearing. Also, can you tell me why the fella always rides in front? Of the tandem I mean. For some reason this really does my head in. I can feel a thesis coming on..better change subject. Onto strange whiffs. Are you scrunching up your nose endlessly like Samantha, of Bewitche fame? Have you opened every drawer yet? OH! That little jumper is fantastic! You should make a whole rainbow of them. How cool that you have a tandem bike... just like the Goodies! Yes, who is wearing that Lycra? Love the puddle fun pic, my 2 yr old would be in heaven too! funny you mention a bad smell around. We have the same thing, I have been on the hunt for a few days and it's driving me crazy. It could be food, wet clothes, or ""Gasp"" my biggest fear a diaper the dog snuck and hid...Why are those smells so elusive when they are so apparently there!!!! Working with pre-schoolers , I am immune to smells ....almost . 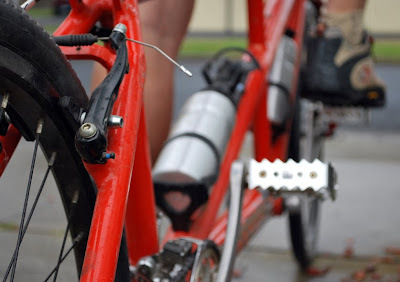 But the thought of tandem riding makes me hyperventilate ....let alone with Lycra . We all have our breaking points . p.s. That's a very , very pretty sweater ! I like the "oooooo's" your faces are doing. Is it shock? Is it ooo fancy? there is a smell I'm on the hunt for too - it may be in the fridge but I can't for the life of me work it out! Nice drawers... not too sleazy?